Living Learning Communities (LLCs) are groups of students who live together in the residence halls based upon common interests  and they’re a fabulous way to get connected on campus! More than just social opportunities, LLCs have peer advisors and residential mentors working with each group to provide academic support. There’s no extra cost to live in an LLC, but the benefits are huge! Data has proven that LLCs increase students satisfaction at school and in Residence Halls, increase the chance of them graduating within four years and also increase their interaction with faculty. Students participating in an LLC live in the same area of a residence hall or apartment community and have frequent opportunities to interact with other students, staff and faculty who share common academic, professional and/or personal interests. LLC residents also benefit from Faculty Advisors and specially-trained student staff who work together to provide an experience that bridges the gap between students’ academic and social lives, and increases their chance for success in college. As a resident of an LLC, you get to help shape the personality and activities of the community to meet your needs and interests. There are also special opportunities  like the annual Murder Mystery Night event that are available only to LLC residents. LLCs are an outstanding way to get involved on campus, be supported academically and have fun! Where is it? : The Aggie Pathway Program LLC is located in Rhodes-Garrett-Hamiel Hall. Who lives there? : This LLC is for students who have been admitted as an Aggie Pathway student. Where is it? : The ACES LLC is located in Garcia Hall West. Who lives there? : The ACES LLC offers students the opportunity to participate in activities that reflect the many majors and career choices within the College of ACES and is a great fit for students who want to live and learn with other ACES majors. This diverse community is home to students from a variety of majors from the ACES College. Anyone may apply to live in the ACES LLC. What do they do? : Activities sponsored by the ACES LLC are as varied as the majors within the College itself! Residents have created floral arrangements, sampled chiles from NMSU’s Chile Pepper Institute, taken a horticultural hike in the Organ Mountains and learned how to overcome test anxiety. Where is it? : The Army & Air Force ROTC LLC is located in Garcia Hall West. Who lives there? : The ROTC program houses up to 28 students from the Army & Air Force programs. To be considered for on-campus ROTC housing, students must first be admitted to one of the ROTC programs. For more information on ROTC requirements, please visit the NMSU Army ROTC website and the NMSU Air Force ROTC website. Where is it? : The Business LLC is located in Garcia Hall East. Who lives there? : Whether they’re interested in marketing, international business, accounting, finance, business administration, economics, or any other area within the College of Business, students will find the Business LLC to be a great match for their interests and career ambitions. Anyone may apply to live in the Business LLC. What do they do? : The opportunities for activities and discussions in this LLC are as diverse as the students who live here! Some past events include presentations by successful NMSU alumni, competing in a stock market game, volunteering at a local soup kitchen and Pizza and a Prof presentations on a variety of business-related topics. Where is it? : The Criminal Justice LLC is located in Garcia Hall West. Where is it? The Education LLC is located in Garcia Hall East. Who lives there? : Students who are going into teacher education can apply to live in the Education LLC. In addition to receiving academic support, students in this LLC often take advantage of the many opportunities to practice education-related skills in a hands-on environment. What do they do? : Residents of the Education LLC have volunteered as face-painters at the Halloween Howl, received tips from a professional story-teller, made ice cream in plastic baggies, and learned from experts how to stay ahead in college. Where is it? : The Engineering LLC is located in Garcia Hall East. Who lives there? : This community is a great setting for students who are interested in majors and careers within the College of Engineering. The Engineering LLC encourages residents to connect with role models and helps them to learn to balance their academic demands while enjoying the college experience. Students must be a declared Engineering major and receive approval from the College of Engineering in order to live in this LLC. Additionally, residents are expected to be actively involved in community opportunities and are required to earn involvement points in this LLC. What do they do? : Recent Engineering LLC activities have included a contest to build the best paper airplane, calculus review sessions, Pizza and a Prof presentations on everything from engineering abroad to the chemistry of beer and a piñata bash. Where is it? : The Exploratory LLC is located in Rhodes- Garrett- Hall. Who lives there? : This community is for those who are undecided and would like to be part of a community that is ‘Exploring’ their options. Who lives there? : The Fine Arts LLC is home to students with a broad range of artistic interests including music, theatre, art, filmmaking and more. Creative energy brings residents of this community together for fun, hands-on programs throughout the year. Anyone may apply to live in the Fine Arts LLC. What do they do? : The Fine Arts LLC has offered a wide variety of programs, including visiting a sculptor’s studio, painting flower pots and planting seeds, a movement workshop, a duct tape crafts night and recital nights. Where is it? : The Global Village LLC is located in the Vista Del Monte apartments. Who lives there? 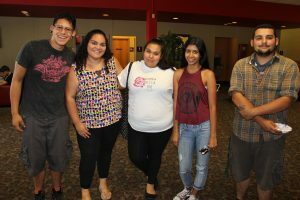 : The Global Village is an internationally-renowned model that brings international students studying at NMSU together with students from the US who have an interest in international affairs and/or travel. Many languages, cultures, majors, and backgrounds are represented in this truly diverse community. In order to apply to the Global Village LLC, students must have sophomore standing or above. What do they do? : Because of the enormous range of interests and experiences represented in this LLC, Global Village allows international students to participate in activities that share the culture of the United States and the unique flavor of the Southwest, while also exposing both domestic and international students to cultures from around the world. Previous events have included an international pot-luck, enjoying America’s pastime: baseball, sushi night, Pizza and a Prof presentations on a broad variety of topics and language tables. Where is it? : The Honors LLC is located in Garcia Hall West. Who lives there? : The Honors LLC is home to students from every College and major across campus. As NMSU’s oldest Living Learning Community, it has become an LLC with a strong sense of identity, community and pride. Students who live here must qualify for Crimson Scholar status (or submit a special request to be approved by the Honors College). Residents of the Honors LLC tend to work hard and play hard! What do they do? : The Honors LLC offers events and activities that appeal to a wide range of interests. Previously, they’ve sponsored events like sustainable residence hall living, volunteerism and service learning, Pizza and a Prof presentations on topics ranging from the history of medicine to border issues to religion and everything in between and a pajama fashion show.. The possibilities are endless! Where is it? : The Natural Sciences/Pre-Medicine LLC is located in Garcia Hall East. Who lives there? : Formerly the Biological Sciences LLC, this community has expanded to include students with majors, interests or classes in Biology, Chemistry, Biochemistry, Geology, Psychology and more! What do they do? : As the Biological Sciences LLC, this community engaged in a number of varied activities including a talk from a medical school student about the application and transition process, study groups, watching popular forensics shows and learning whats real versus what’s TV magic and health and wellness activities like yoga for stress management. Now, as the scope of the community has broadened, the possibilities for programs are unlimited! Where is it? : The Nursing LLC is located in Garcia Hall East. Where is it? : The Osteopathic Medicine Pathways LLC is located in Garcia Hall East. Where is it? : The Pre-Pharmacy LLC is located in Garcia Hall East. Who lives there? : This LLC gives students interested in majors and careers related to pharmacology the chance to socialize and study with others who share their ambitions. In order to live in the Pre-Pharmacy LLC, students must be admitted to the UNM/NMSU Cooperative Pharmacy Program and approved by the program’s coordinators. What do they do? : The students in the Pre-Pharmacy LLC have had opportunities to participate in a variety of community service projects, received academic help during study and advising sessions, learned about compounding using ice cream and heard presentations from professional pharmacists. Where is it? : The PGM LLC is located in Garcia Hall East. Who lives there? : This community is the ideal setting for students interested in majoring in or learning more about Professional Golf Management. In order to live here, students must be admitted into NMSU’s PGM program and receive approval from the program’s Director. What do they do? : The only one of its kind in the country, this dynamic community offers students the chance to attend golf outings, support each other at tournaments and connect with others who share a love of golf. Where is it? : The Social Sciences LLC is located in Garcia Hall West. Who lives there? : Students majoring in Anthropology, Psychology, or Sociology. What do they do? : Students take a common course in the Social Sciences and have specialized events related to these majors. For additional information regarding Living Learning Communities, please contact the Department of Housing & Residential Life at (575) 646-3202. Living Learning Community offerings and qualifications are subject to change.